I can NOT believe I am going to show y'all these photos. All summer long we've kept the ceiling fans on. If we turn them off, it's usually because we are leaving the house. So who ever noticed they were dirty? And BOY are they dirty!! Just look!!!!!!!!!!!!! And this is the dust that came off ONE ceiling fan!!!! WHY am I showing y'all these horrifying photos?? So that this scene is NOT repeated in YOUR home!!!! Do your family a favor and go right now and look at your ceiling fans and see if they are dirty. If so, CLEAN THEM!!!!!!!!!! UPDATE: Y'all!!! Mrs. B just left a comment and said "
One thing that I've found that helps is to polish them with furniture polish and then the dust doesn't seem to stick to them as easily." What an EXCELLENT tip!! Thank you, Mrs. B!!!!! Mine look exactly the same way! Oh my! I sympathize with you. Mine look the same way; I finally had to clean them yesterday. It's amazing how quickly they catch dust! Oh I thought that in the first photo there was paint splattered on the fan - that is quite a lot of dust! I don't have any ceiling fans but I can understand how you can forget about dusting them when you can hardly see them! Been there, done that! LOL (o; You are a brave woman to post those pictures! Oh ys I know what you are talking about my look like that and I try to clean them every week. I am trying to do better about cleaning them. I was so upset with myself for letting it get this way. It's a never ending job to keep a home clean, at least for me. Well maybe if I actually "cleaned every now and then" it wouldn't look like it does now!!!!! Thanks for the encouragement for me to continue! Thanks to Mrs B for the polishing tip too!!!!!! Silly lady, that's why we turn them on in April and don't turn them off until November! (We live in AZ.) I feel your dusty pain. Ours would be the same, except our quarterly deep cleaning has us hitting all the fans at least once during the 'on' season. Then yes, we have to clean them again once they're off. This is when it's handy to have a tall husband! My oldest son cleans our ceiling fans monthly! Using furniture polish is a good idea and have you seen the long handled brush made just for fans? Those pictures remind me of how my fans looked when we lived in our rental house (because I never dusted them). 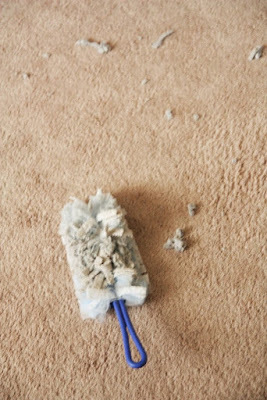 As well as using furniture polish, the key is to clean them regularly so that the blades don't collect "dust bunnies." I dust the furniture and knick knacks (as well as our ceiling fans) every other week. I have noticed that when I keep-up with dusting them regularly, they don't collect as much dust either. 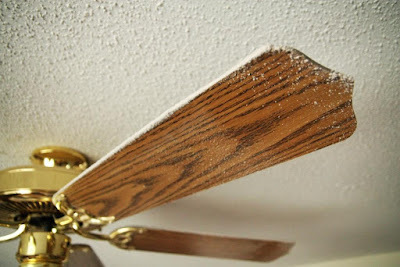 Also, it's good to dust the base of the ceiling fans as well as the light domes (if your ceiling fans have light fixtures) because nasty dust collects there too. Dust is SO annoying (smiles)! Are you sure those pictures were not taken at my house??? I love my slow cooker! !